Cooking in our family is a family affair we all love to cook and that means our 11-year-old daughter as well. She made a quick and easy Chicken Noodle Soup to warm us up on a cold day. 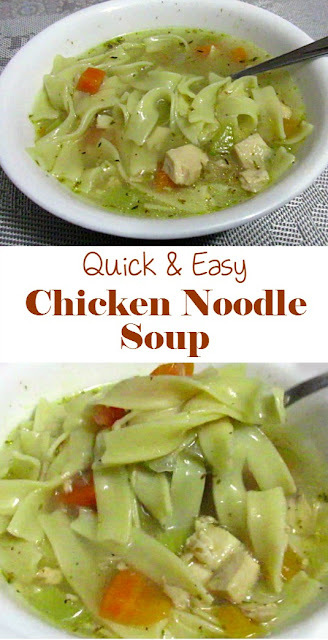 We used our Shopease Foods Chicken to make this delicious soup and with the rising costs of food in Canada right now you can lock you prices in for the year with Shopease Foods. Be sure to check them out and tell them I sent you. This sounds takes about 30 minutes start to finish and it is so easy even my child can make it. To a large soup pot add the oil and turn heat on medium. Add the carrots, celery, onion, and sauté until vegetables begin to soften. Stirring occasionally. Add the garlic and sauté for another 1 minute. Add the chicken broth, bay leaves, thyme, oregano and bring to a boil. Allow mixture to boil gently until vegetables are tender. Add the egg noodles and boil soup until noodles are soft and cooked through. Feel free to add more broth if soup seems too thick. Add the chicken, parsley and boil 1 to 2 minutes, or until chicken is warmed through. Remove the bay leaves, and serve immediately.